Yesterday Padstow….. or at least a small representation of Padstow descended on St Just for the annual charity rugby match. In the past the knocked together team have taken on the Combined Services, a Bodmin team and now it was St Just’s turn to get their behinds handed to them. Tom and Cal both put in their stints for the team and Brinner and I decided to watch with a few beers from the sideline! It was a great game and a lot of money was raised for the Padstow branch of the British Legion, there was an auction and then a bit of a sing song. And it’s this that I wanted to talk about a bit. As well as us Stowes boys, there were the masses from Padstow all in fine voice and some of the Cape Cornwall and Newquay boys as well. 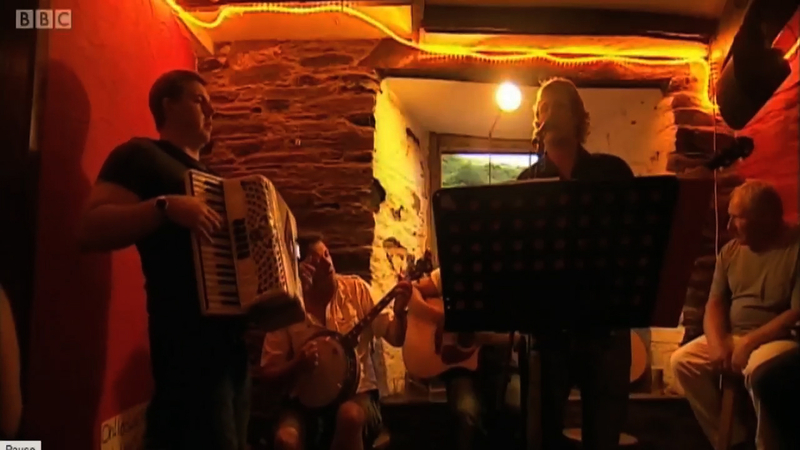 All joined in with some classic cornish tunes as well as a few other well known folk classics. With every song that was sung (and admittedly with each beer that was drunk) it hit me even more just how lucky we are down in Cornwall to have the music and community that we have. It’s something that cannot be beaten…. The passion in everyone’s faces as they sang ‘Cornish Lads’ was plain to see, it pulled together the older generations, the rugby gang and the younger family members and supporters. You wouldn’t get that if you walked into a pub in other parts of the country, maybe even the rest of the world. It’s Cornwall’s way of uniting, it’s a way to show our defiance, it’s a way to show that we can’t be budged, it’s Cornwall’s way of showing that it’s still a community. For as long as I can remember there’s always been a song to be sung, in a pub, after a rugby match, on a bus, in our homes, everywhere. Maybe it’s the fact that people consider us to be cut off from the rest of the country……. Maybe some people think that with the train lines down we’ll feel even more isolated from the rest of the UK. But listening to those songs being belted out, singing One and All, it showed that we aren’t cut off in any way, shape or form. We’re as together as we ever have been, we’ve got our friends, we’ve got our lives and we’ve got our songs. And that ain’t a bleddy bad place to be at all. As the Cape Cornwall boys sang so melodiously………..
So… we received a message today from Radio Cornwall’s very own David White to let us know that our version of ‘The Fox’ and ‘St Anne’s Reel’ will be featured on this weekend’s BBC Introducing radio show. It’s a brand spanking new recording and will feature on our first EP……… which we’ll also have news about very soon indeed. If you can listen live then that’s fantastic. If not then there’s always BBC iPlayer so that you can have a listen again. Spotlight turns on to The Stowes……. well kind of!! What a busy couple of weeks we’ve had. It’s fair to say that when we’re all home together, and available, we like to get our music heads on! The next day we headed over to Port Isaac for an informal session with a few members of Fisherman’s Friends. A few ales were drunk, many a song was sung and a good night was had by all. Every time we pop over to Port Isaac we are always made so welcome, not only by the guys, but also the rest of the village and many of the holiday makers who kindly applauded each song and chatted away to us during moments of rest and recuperation. It’s fair to say that we like spending time over there so within 3 days we were back there again! Jon Cleave has kindly invited us to a few open mic evenings held in the Bones Bar. They are great, atmospheric and very busy evenings with a wide range of talents on show. It’s not just music on display either. Readings, poems and the odd joke or two also grace the microphone and a beer or two was also consumed. Tom and Kev got up and performed a couple of tunes together, Calum got everyone singing ‘Down By The Riverside’ and Toby got to play one of his own songs ‘She Will Wait’ with Billy from Fisherman’s Friends accompanying him. We then were lucky enough to be invited up together to perform a couple of ‘mini sets’ and each song was really well received by the audience. And this is where the Spotlight element of our blog’s title comes in to play. BBC Spotlight had been filming a feature on Port Isaac to include in a future broadcast and they wasted no time in pointing their cameras at us for a few songs. We thought nothing of it, thinking that we would end up on the cutting room floor as most footage does (Toby should know considering his day job). We were pleasantly surprised this week to find that our rendition of ‘Harry’s Song for Cornwall’ was featured quite heavily at the end of the piece as well as some lovely close up shots of Kev, Calum and Tom. Toby, however, had wisely chosen to hide himself behind Cleavie’s music stand so as not to damage the camera lens. Spotlight’s facebook page featured a few enquiries on who the band was at the end and what the song was so all in all it was a good positive experience and a nice little showcase for the Stowes boys as well. We’ve finished this busy little period with a nice relaxed Sunday gig at Padstow Social Club. It was great to see the place busy and we had a lovely reception from those that came to listen. Next up we have the Cornwall Folk Festival at the end of August and then a bit of an enforced break while Cal and Tom are both at sea…….. Plus Tom’s wedding which is getting closer and closer. We’ll keep you updated as and when bits happen. What tracks are we going to include on the 6 track EP? This is a question that we are struggling to answer. We are stoked with every track so it’s going to take a while to choose those half dozen tunes. When we decide, we’ll let you know. We’ll also let you see the artwork in advance. As you may have seen from the ‘Meet the Band’ section of our website, when I’m not messing around with guitars I’m earning a living as a video producer with ikandi:media so I’ve always got a camera to hand. This May Day I managed to start getting some footage of the day shot at 50fps (½ speed slo-mo) as well as a few shots of the days leading up to May 1st as well. There hasn’t really been much edited footage of May Day put out into the public domain, usually just a bit of home video footage put on to YouTube or 20 seconds of footage on the local news, so I’m trying my best to get together a nice looking video that not only shows a bit of the Osses and band in action but also, and I think more importantly, shows the smiling facesand community spirit on display during the day. It’s a beautiful day, it can’t be described at all, it is genuinely one of those things that you really need to experience to come close to understanding it. It’s a day that means a huge amount to every member of The Stowes, we’re all actively involved in the day, and I only hope that once I’ve pieced together the footage that it does the day and the town justice. This is just a trial run, it’s mainly of the Blue Ribbon Oss as I didn’t venture too far from my gang this year, and hopefully some of the footage will go into a much larger project that I have planned which will hopefully document the day in a creative, musical and visually interesting way. For that I’ll need to get another May Day’s worth of footage and a whole lot of sound engineering ideas. For now I’ll add a few stills from the footage for you to take a look at. On the 8th December we were lucky enough to be asked to play at Padstow’s Annual Christmas Festival which is now really highly regarded not only in the UK but also throughout Europe. We played a 2-hour set on the bandstand next to the harbour (a stage that the next day was occupied by the Fishermen’s Friends from Port Isaac). The gig was a real success, with a crowd of a few hundred people all clapping, singing, dancing and laughing along with us. Highlights of the set included a great version of ‘Leaving of Liverpool’, our first ever public performance of ‘Cornish Lads’ which was sung a cappella and finally, to get the crowd ready for Christmas, we got our friend and guest singer Zoe up to sing ‘Fairytale of New York’ with us. We took a feed from the desk to record the set and also had a couple GoPro cameras and Canon 550d DSLRs on hand as well to film the gig. We’ll try and get a couple of songs uploaded to our YouTube Channel as soon as we get a few spare minutes during the Christmas Holidays. Well the new site is starting to take shape. We’ll do our best to get more info, vids, tunes and much more up as and when we can. We’ll hopefully get a bit of a blog going as well so that you can get a better idea of how we all tick!! For now, enjoy a few tunes, and we’ll catch up soon.